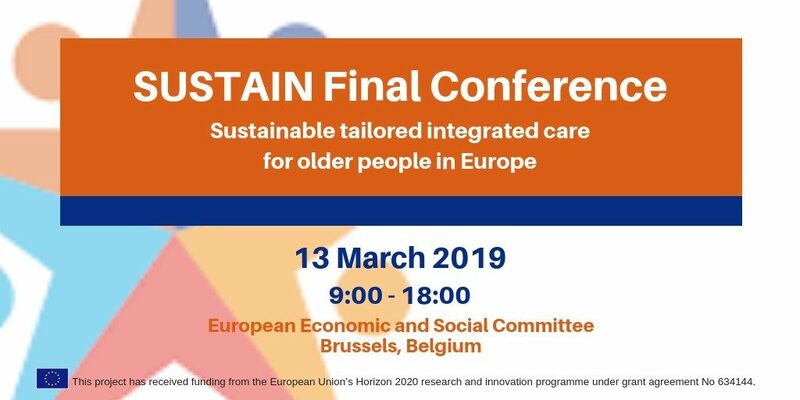 The SUSTAIN consortium is glad to announce the SUSTAIN Final Conference, which will take place on Wednesday, 13th March 2019 at the European Economic and Social Committee. You are warmly invited to take part in this one-day event in Brussels, Belgium. During the conference, the SUSTAIN project will be presented in all its aspects: the research carried out within its framework will be showcased; the integrated care sites which took part in the project will be introduced; and the achieved results and project outcomes aimed at supporting better integrated care for older people, as the SUSTAIN Roadmap for Integrated Care. Further information on the conference programme will be released soon but we invite you to register online to ensure your participation.